!!! PLEASE see the new MEDTEQ website www.medteq.net for latest information and the newer model HFIT 8.0 !! The information here is retained for reference only. Model HFIT 7.0 also remains available for sale. 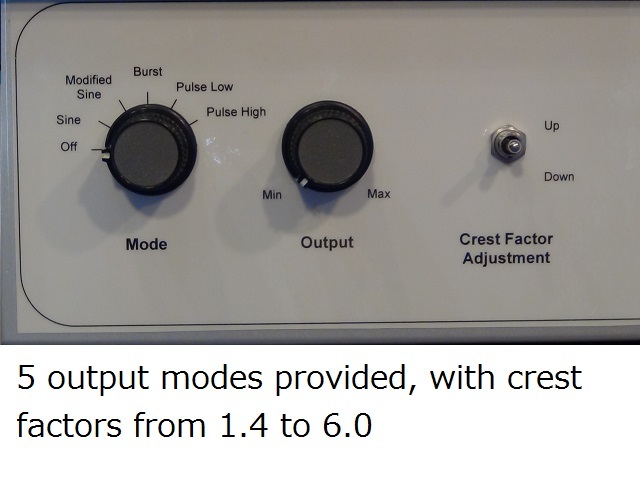 Crest factor ranges may depend on the load characteristics (capacitance and dissipation factor). The HFIT is designed to have overlapping ranges so that the required crest factor in IEC 60601-2-2 can be obtained assuming reasonable quality insulation materials..
To handle the very high VA loads associated with both high voltage and high frequency, a resonant circuit is used. This method allows peak of up to 10kVA, and continuous outputs of 300VA. Due to the use of a resonant circuit, the fundamental frequency varies with the capacitive load. The equipment is designed to have approximately 440kHz open circuit, reducing to aroun 315kHz at full load (100pF for the standard model). Many manufacturers rate insulation using "volts peak to peak" or "Vpp", which is approximately two times Vp ratings. The maximum output of the MEDTEQ HFIT is approximately 13kVpp. For test laboratories, the standard model (HFIT 7.0) has been designed to provide a variety of waveforms to ensure that the requirements in IEC 60601-2-2 can be tested from the leakage current test (400Vp, crest factor 1.4) to insulated rated at up to 6000Vp (test volatge 7200V, crest factor 6.0). Limited option models are also availble for manufacturers that may have a certain range of test requirements (e.g. endoscopic insulation). The load range (capacitance in pF) varies as a function of the peak output voltage required. Frequency stabilized versions are also available depending on the peak voltage and load requirements. The HFIT includes a internal 1000:1 divider which is adjusted to be within 0.5% in the range of 300-500kHz using two independent methods . The equipment also includes a 1Ω high frequency shunt to allow current monitoring and leakage current testing. The user can monitor the applied voltage and load current using an oscilloscope. Customized versions are also available (including pulse repetiton rates, modes). For more details, refer to the HFIT Operation Manual. For quotes or additional information please contact MEDTEQ.